Sign up for an upcoming webinar and learn about our TracerPlus and ClearStream products and features. 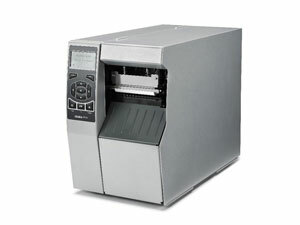 The Zebra ZT510 Industrial Printer builds on the success of its industry-leading 105SLPlus predecessor, providing rugged durability and reliability, along with fast processing, intelligent Link-OS capabilities and future-ready adaptability to power through every challenge for years to come. The budget-conscious ZT510 kees critical operations running smoothly with a printer that strikes a balance between performance and value. 4.09" Industrial Printer, Tear Bar, 203 dpi, 12 ips, Ethernet, USB, Serial, Bluetooth, Thermal Transfer. 4.09" Industrial Printer, Rewind, 203 dpi, 12 ips, Ethernet, USB, Serial, Bluetooth, Thermal Transfer. 4.09" Industrial Printer, Tear Bar, 203 dpi, 12 ips, Ethernet, USB, Serial, Bluetooth, 802.11 AC, Thermal Transfer. 4.09" Industrial Printer, Cutter, 203 dpi, 12 ips, Ethernet, USB, Serial, Bluetooth, Thermal Transfer. 4.09" Industrial Printer, Tear Bar, 300 dpi, 12 ips, Ethernet, USB, Serial, Bluetooth, Thermal Transfer. 4.09" Industrial Printer, Rewind, 300 dpi, 12 ips, Ethernet, USB, Serial, Bluetooth, Thermal Transfer. 4.09" Industrial Printer, Tear Bar, 300 dpi, 12 ips, Ethernet, USB, Serial, Bluetooth, 802.11 AC, Thermal Transfer. 4.09" Industrial Printer, Cutter, 300 dpi, 12 ips, Ethernet, USB, Serial, Bluetooth, Thermal Transfer. Founded in 2000, PTS is a leading developer of user configurable barcode and RFID software. We are the makers of the widely popular TracerPlus and ClearStream RFID software which are Free to Try. This site is secured with Geotrust to protect your billing information. © 2000-2019 Portable Technology Solutions, LLC. All rights reserved. No images or content from this website may be used without prior written permission.